May and June are the traditional wedding months, particularly in the United States. A wedding gown is much more than just a dress, it is a treasure, a symbol of an important event in your life. Whether you are borrowing it from a relative or buying it new, your gown deserves your attention, both before and after the wedding. 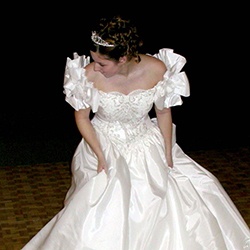 Most brides want to preserve their gown as a keepsake, particularly if the gown is an heirloom. 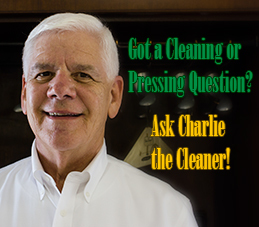 Cleaning industry experts recommend that you have your gown cleaned as soon after the wedding as possible. The gown may have invisible stains from food, beverages, and body oils. If these stains are not properly cleaned, they may become permanent. Therefore, it is important to point out any stains or spills to your cleaner before cleaning. Most wedding gowns have some sort of decorative trim. It is important to inspect these trims with your cleaner prior to cleaning since some trims are not made to withstand the drycleaning process. Some beads and glitter are made of plastics or covered with surface coatings that are not solvent-resistant. In many of these cases, the trim becomes separated from the dress or altered in some way. In some cases, decorative trims yellow as the finishes oxidize. An ivory or ecru trim may lose its color and no longer match the gown if a dye component is lost in cleaning. Color failures of this type are due to poor colorfastness of the dye, not to improper cleaning. When it comes time to clean your gown, take it to your cleaner for professional drycleaning or wetcleaning. There are many specially trained cleaners who can assist you with storage of your gown for a fair and reasonable price, making it unnecessary to send your gown away for cleaning and storage. The most important factor to consider in wedding gown storage is that your gown must be properly cleaned before storage. Be sure that you feel comfortable with your professional cleaner’s reputation before taking your wedding gown to be cleaned. Problems arise after a wedding gown is cleaned and all concerned discover that there is no safe or satisfactory method to restore the gown to its original appearance. Let us pack the gown in a special storage box that will help prevent contamination. Store your garment in a cool, dry place. Do not store it in a basement or attic. Basement dampness can cause mildew; attic heat can promote yellowing of the fabric. If you are storing a long wedding gown on a hangar, sew straps to the waistline of the dress to relieve pressure on the shoulders from the weight of the dress. Wrap the dress in a protective white sheet or muslin covering. Whether the gown is hung or boxed, the bodice should be stuffed with white tissue paper to prevent wrinkles. It is a myth that blue tissue paper helps to preserve a wedding gown. It can add up to disaster if the gown ever gets wet. Blue dye can transfer onto the gown, making restoration very difficult, if not outright impossible. Use pure white tissue paper only. Never store headpieces, veils, shoes, bridal bouquet, or other accessories with your gown. Consult your florist about bridal bouquet storage. Inspect your gown from time to time during storage (your anniversary date is a good time to remember). Stains not initially apparent could appear later, and should be tended to immediately.